“Moratorium to End the War in Vietnam,” Histories of the National Mall, accessed April 22, 2019, http://mallhistory.org/items/show/220. 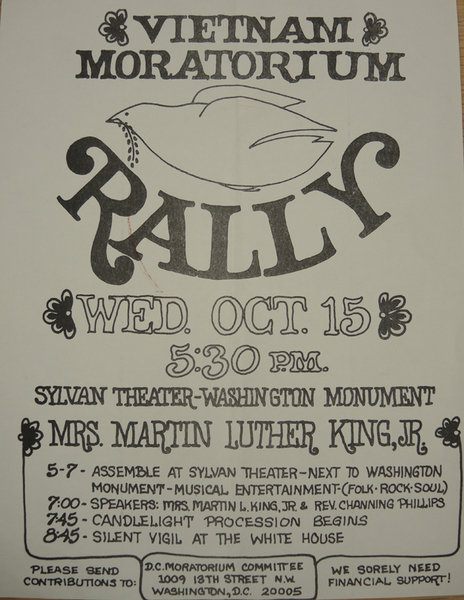 The Moratorium to End the War in Vietnam began as nationwide anti-war protests which took place during October 1969. A month later, on November 15, roughly half a million people gathered in Washington for anti-war activities. Protesters spoke out in all parts of the city, including on the National Mall. Folk singer and activist Pete Seeger led a large group in singing protest songs near the Washington Monument. The March Against Death took protesters past the White House, where they spoke aloud the names of American soldiers who had been killed in Vietnam, often naming a relative.